Oneworld is the third largest airline alliance in the world after Star Alliance and SkyTeam. It was formed in 1999. Oneworld is the world's biggest alliance that brings together ten best airlines, all committed to providing world-class service and value. It is based in Vancouver, British Columbia, Canada. Oneworld Management Company has a Managing Partner, reporting to the alliance board, which is made up of the Chief Executives of each of the member airlines. Member airlines and their affiliates enjoy a high degree of co-operation in scheduling, ticketing, code sharing, flight transfer operations, frequent flyer benefits, shared airport lounges, reducing costs, and sharing best practices. It is the biggest airline in the world, with its regional affiliates American Eagle and the American Connection carriers. It serves some 260 cities in 50 countries with around 4,200 daily flights. It operates major hubs at Dallas/Fort Worth, Chicago O'Hare, Miami and San Juan. A leading international airline, that serves its flights to more than 200 airports and 90 territories, with its main hub London Heathrow, the world's busiest international airport. Cathay Pacific Airlines was the flag carrier of Hong Kong was established in 1946. The airline is the Asia�s largest airline and it offered scheduled cargo and passenger services to over 120 destinations around the world. Its main base is Hong Kong International Airport. Finnair is the famous Nordic European airline, serving its flights to 60 cities in approaching 30 countries with more than 250 daily flights. Its main hub is Helsinki, an ideal gateway from the continent into Europe. Iberia Airlines is the leading carrier between Europe and Latin America. It serves flight to 40 countries with main hubs in Madrid and Barcelona. JAL is the largest airline in the Asia-Pacific region. Five JAL Group subsidiary airlines have also joined oneworld as affiliates - JALways, Japan Asia Airways, JAL Express, J-AIR and Japan Transocean Air. Its main hubs are in Tokyo, Osaka, Nagoya and Okinawa. LAN Argentina and LAN Ecuador joined other airlines in the LAN alliance as members of oneworld in 2007. Chile-based LAN Airlines, which is widely recognized as Latin America's leading airline LAN Express, which operates domestic services with Chile and LAN Peru. The LAN alliance's main hubs are Santiago, Buenos Aires, Lima, Quito and Guayaquil. Mal�v is the flag carrier of Hungary, based in Budapest. It provides the oneworld alliance with one of the best hubs in Central and Eastern Europe. Mal�v as one of the leading airlines in the Middle-European region that operates scheduled passenger, cargo and charter flights. Qantas is one of Australia's best-known and strongest airlines. The airline operates a fleet of 195 aircraft to domestic network in Australia and, worldwide, offers services to more than 85 destinations in 40 countries. Royal Jordanian, the national carrier of The Hashemite Kingdom of Jordan, is the first airline from the Arab world to join a global airline alliance. Its Amman base provides the alliance with one of the best hubs for traveling around the Middle East to more than 50 destinations in some 30 countries. From Adelaide to Zurich, from Argentina to Zimbabwe, the Oneworld� alliance's network reaches out to all over the world. 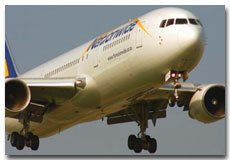 Our member airlines together serve more than 130 countries with flights to more than 675 destinations. Oneworld is the only alliance with a full network in Australia and South America. The Oneworld schedule is available for you on-line and through a variety of downloadable tools. Choose between a desktop version, PDF, Palm - Windows, Palm - Macintosh, Palm - Generic and Pocket PC. Oneworld� alliance does not offer its own frequent flyer programme if you are a member of American Airlines AAdvantage� Program, British Airways Executive Club, Cathay Pacific Marco Polo Club, Finnair Plus, JAL Mileage Bank, Iberia Plus, LANPASS, Mal�v Duna Club, Qantas Frequent Flyer or Royal Jordanian Royal Plus, your rewards and privileges are extended throughout the oneworld alliance. Flight schedules include all oneworld member airlines and their affiliates, as well as non-oneworld codeshare partners. Oneworld was voted as the world's best airline alliance in the 2004 Business Traveller Awards and named the World's Leading Airline Alliance for the fifth consecutive year at the 2007 World Travel Awards. The ten member airlines of the Oneworld alliance share a common goal to make worldwide travel a smoother, more rewarding experience for our customers. Oneworld has developed a range of innovative travel products that offer convenience, flexibility and excellent value for money. Whether traveling for business or leisure we are confident that you will find the right product for your regional adventure or round-the-world journey.